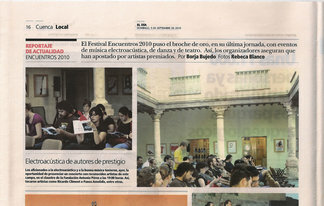 I have arrived home from a wonderful trip to premiere my tape piece La leggerezza delle città at Encuentros Cuenca. The festival was fantastic, the dance in particular standing out, and the cloister of the Fundación Antonio Pérez with a view across the valley proved a beautiful setting for the concert of electroacoustic music, which also included music by Donal Sarsfield, Panos Amelides, Irma Catalina Álvarez and Ricardo Climent. 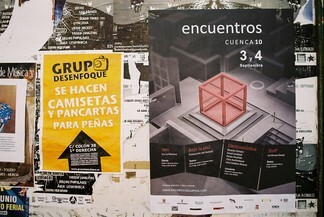 Many thanks to all the Encuentros Cuenca team. It was great to meet them all!